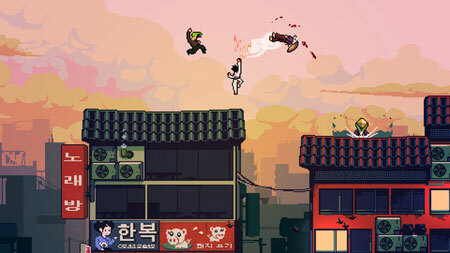 Roof Rage is a martial arts platform fighter game developed by Early Melon. It is a fast paced, easy to pick, hard to master, platform fighter, which features epic rooftop battles, play with up to 8 players locally or 1vs1 online. The scale and speed of Roof Rage allows you to be creative, always producing new combos and pushing the gameplay a little bit further. Choose from a diverse cast of 8 characters, each one offering a unique playstyle. You can pick and throw roof tiles, catch them, deflect your opponent’s projectiles, wave-dash, parry and smash attack for a finishing move. Pick your stage among 8 iconic, cultural inspired, rooftops. Enjoy 9 different challenging levels and 10 awesome 16bits soundtracks. If you get stuck in the game, check out the video walkthrough and gameplay for the game. This entry was posted in PC Games, Walkthrough and tagged Roof Rage Cheats, Roof Rage Game, Roof Rage Gameplay, Roof Rage Guide, Roof Rage Hints, Roof Rage Review, Roof Rage Solutions, Roof Rage Strategy, Roof Rage Tips, Roof Rage Walkthrough by Marvin. Bookmark the permalink.